It appears you have quite an off-the-roof avalanche brewing if a warm snap ever comes your way ... don't wait too long to move the truck! Advice well taken. 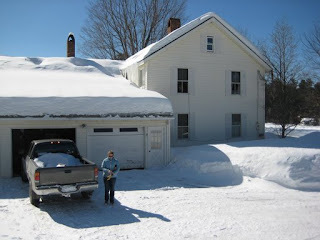 In 1974 an ice-dam came off the eaves of our first NH house and put a nasty dent in the rear of Shirl's wedding present (a 1973 Datsun 240Z).